← Adult Sibling Rivalry in a Toy Store! 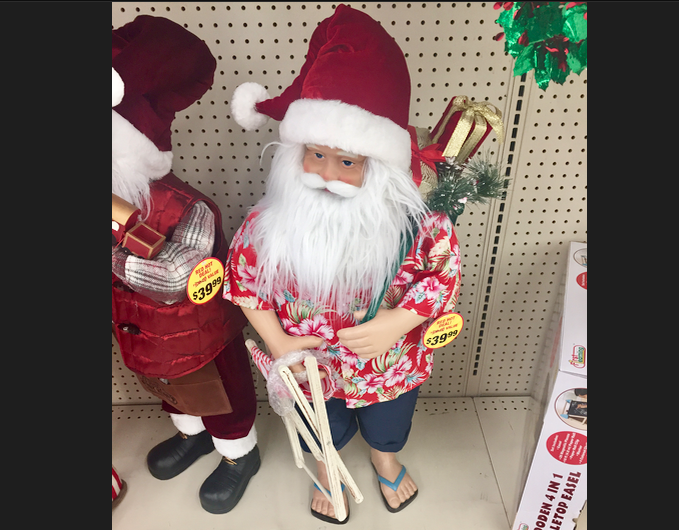 My husband George saw this beach-bound Santa decoration at CVS, and he thought it was so cool. He’s thinking of wearing a similar outfit to the family Christmas get-together. I think that would be a hoot! We do live in California, so the chance of snow is slim. Plus, there’s a slight similarity, don’t you think? Here’s a short video with some other Santas at CVS. Isn’t that St. Nick in PJs with reindeer slippers cute? Who thinks this stuff up? You do believe in Santa, right? If not, my friend Maria Cisneros Toth might convince you in this post from 2011, Santa is very real. Are you enjoying the hustle and bustle of the season? I have to confess I’m feeling rushed and overwhelmed, and I’m not even out and about doing a lot of shopping. I avoid crowds as much as possible. Some people decorate every room in the house. I’m not one of those people. How about you? How do you handle the holiday season? Is this your favorite time of year? I’d love to hear your thoughts. Are you gong-ho with holiday decor and activities, or do you prefer quiet holidays? Which version of Santa do you like the best? 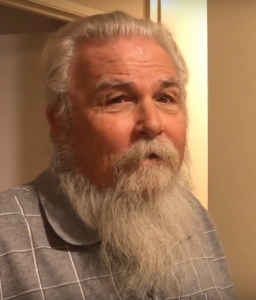 This entry was posted in Holidays, YouTube Video and tagged California Santa, life-size Santa decoration, Lynn Kelley, Santa Claus decorations, Santa in PJs, Santa is very real. Bookmark the permalink. George would definitely make a good Santa…the beard is real, folks!!! I like parts of this season, but I do believe it is way over done and there is far too emphasize put on the guy in red and spending money. It would make me happy to see the focus mainly on the birth of the savior, and see relationships mended in families. A little shopping, sure, but not too much. Hi Pam! I feel the same way you do about the Christmas season. Gotta keep the right perspective on the celebration and keep it low stress. Thanks for visiting and sharing your opinion! I vote yes on the Hawaiian shirt, George can pull it off! Ditto to above comments. We are drawing names this year for less focus on stuff. My favorite tradition is the Gift of Words, every other year when all the kids are here (#marriedkids) I read them a page of all the wonderful things I see in each one. I include a favorite memory from the year and all the encouragement, prayers, and love I feel. When I die, I don’t want to leave any positive words unsaid or unwritten. We love to decorate, bake, and shop, but this is the one thing everyone loves the most. The key is making sure people are more important than stuff and all roads point back to reason for the season! How wonderful to see you here, Meg! I love your tradition of the Gift of Words. That’s so beautiful! I think George would look so good as a summer Santa!! 🙂 Go, George! I think so, too. Now to get him to wear an outfit like that, then video him as Beach Bound Santa! LOL! Thanks for stopping by, Yvette!